Ms. Celiac Says...: Pasta Time! Are you looking for some delicious easy-to-make pasta meals? Well, look no further than Caesar's line of gluten free pasta products. I've tried the Vegetable Lasagna and I absolutely love it. It comes as enough for 1 serving size, but is very filling. To find out more information, please visit their website at www.caesarspasta.com. 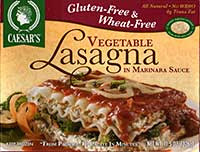 Caesar's Gluten Free Pasta Meals are available at select Whole Foods Markets. Raising Your Dog Gluten Free? Very Good Gluten Free Granola! Get Your Super Healthy Iced Tea Today! Starbucks Discontinues Gluten Free Pastry!!! Betty Crocker "Sweet Moments" Contest!!! Eat Some Yummy Falafel Chips!